Vikram Patel near his farm pond in Chidavad. “For the last two decades, the Chidavad village in the Tonk Khurd block, was one among the parched villages in the Malwa region. The women of the village walked more than 3-5km just to bring drinking water home. The traditional water-harvesting practices had almost vanished from this region. The villagers had started migrating to other places in search of livelihood and the farmers were getting caught in debt traps,” says Patel. In 1984, when Patel took the initiative to build his first farm pond, nobody believed that it would reap benefits for him. But it did. The idea, however, found no takers until Raghunath Singh Tomar--another farmer from Tonk Khurd block--dug a farm pond in Harnavda during the acute water crisis in 2005. That year, he earned double the amount he spent on the farm pond from his farm. 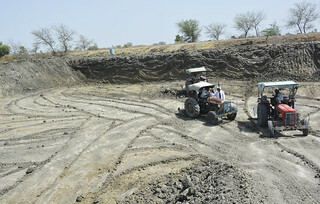 Since then, many farmers have taken the initiative to build farm ponds to improve the groundwater situation. There are more than 5000 farm ponds in the Tonk Khurd block now which have substantially improved the groundwater table in the area. During the water crisis in the recent past, the farmers of Chidavad dug more than 1000 tube wells in their 250 acres of farmland in search of ground water, out of which, only 50 per cent was found to have the capacity to yield water. The farmers then decided to construct farm ponds around those tube wells that had water. “When we built farm ponds near the tube wells, we found the groundwater table to improve considerably,” says Baoji Daya, a farmer in his mid-40s. Chidavad village now has 200 farm ponds. These incidents prompted the Dewas district administration to encourage the farmers to build farm ponds as a solution to the water crisis in the area. As a result, the farmers constructed more than 10,000 farm ponds since 2006, but it is only in the Tonk Khurd block that the groundwater recharge has been a major success. It’s not providence but its terrain that has favoured Tonk Khurd. The entire district stands on basalt rock. The basalt terrain is hard and water can enter the rock only through fractures. The water that seeps through these fractures gets collected in the void of the rock called aquifers. “The specialty of the Tonk Khurd terrain as per groundwater experts is the many fractures on the basalt rock beneath it. Due to these fractures on the rock, the land is pervious, enabling the water to seep through the fractures easily. Building farm ponds in such a terrain proved beneficial to the farmers as compared to the other blocks of Dewas with impervious landscape. 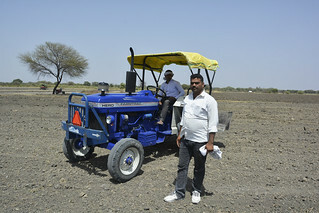 After three to four years of building farm ponds in the Tonk Khurd area, the farmers have seen significant improvement in the groundwater availability,” says hydrogeologist Sunil Chaturvedi. Going by the district groundwater information booklet of Dewas in 2013, only the Tonk Khurd, Bagli and Kannod blocks of the district have the groundwater level in the safe zone. In the Khategaon block, the groundwater is in semi-critical condition and Sonkatch and Dewas blocks are the most critical areas. In 2012, Manthan Adhyayan Kendra--a non profit organisation in Barwani, Madhya Pradesh--working on water sector and policy issues in India published a case study on the privatised industrial water supply project in Dewas. It concluded that the industrial water needs and the drinking water needs of the people in Dewas were not adequately met even after procuring Narmada's water from a distance of 128km. The Dewas district and the adjoining areas of the Malwa region in Madhya Pradesh are facing water scarcity due to the withdrawal of large amounts of surface and ground water for industrial, agricultural and urban needs. The success of the improvement of groundwater table in Tonk Khurd cannot be entirely dedicated to the farm ponds. In addition to the ponds, the farmers have adopted ways of recharging groundwater like drainage channels around the farm ponds and aquifers, soak pits around tube wells, rooftop harvesting, and more. The Dewas district is a good example of the fact that when it comes to solving water crisis, one size does not fit all. The groundwater recharge depends on the geomorphology of an area. Every village should develop its own groundwater recharge security plan. "The Aquifer Management Programme by the government is an excellent initiative to help understand groundwater through aquifers. Collaboration on ideas and community partnerships hold the key to the success of groundwater management in India,” says groundwater expert, Dr Himanshu Kulkarni of Advanced Center for Water Resources Development and Management (ACWADAM), a non-profit organisation in Pune. “Farmers should identify cropping pattern according to the availability of the groundwater, surface water, rainfall and the geographical terrain. The problem with most of our farmers in the country is that they are moving more towards water intensive crops like cotton, sugarcane, etc. 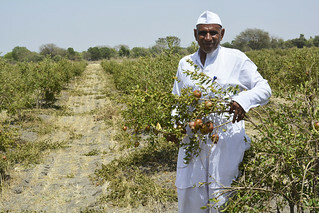 and paying less attention to the alternatives which suit the climatic condition and the geographical terrain,” says Bhagawan ZagguKengar, a farmer in Yavatmal district in Maharashtra which is reeling under severe water crisis. In his seven-acre-farm, Vikram now grows fruits like mango, sapodilla (cheeku), pomegranate and vegetables like guard-bottle, scallion (green onions), etc. He earns a profit of Rs 1000 per day from his farm. He uses drip irrigation method to irrigate his field and uses water effectively without wasting it. You can read about the benefits of farm ponds here.